Totally unobstructed views!! Spectacular Oceanfront condos with great views from this 3 BR 3 BA Hampton Place condo in Palmetto Dunes. See the Atlantic Ocean directly from the kitchen, living room, master suite and one guest bedroom, views are everywhere. See the moon and sun rise over the ocean. Look over the Hampton Place pool and out to the Atlantic ocean where dolphins and pelicans play. Free Health Club on site and only seconds to world famous beaches on Hilton Head and only minutes to golf courses, tennis courts, restaurants and bars in Palmetto Dunes. 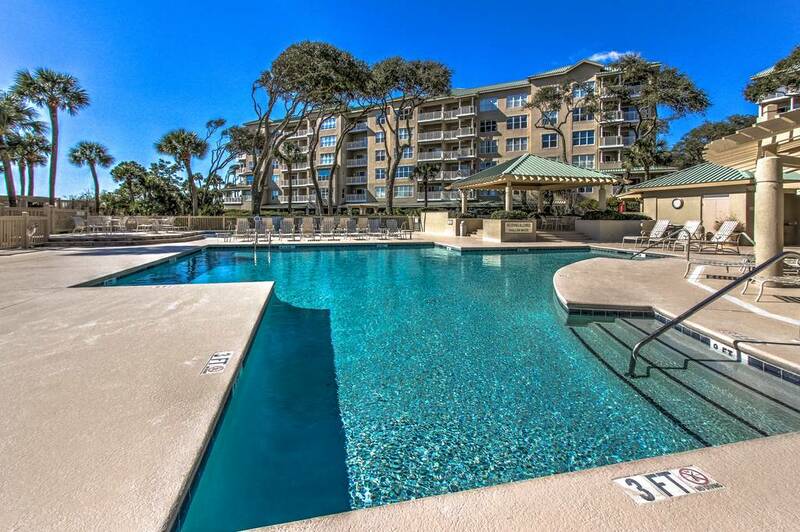 3 BR 3 BA Oceanfront condo in Hampton Place is the location for a vacation on Hilton Head Island. Only seconds to world famous beaches, an oceanfront pool, covered parking while only minutes to championship golf courses and tennis courts. Updated with new granite counter tops, new stainless steel kitchen appliances, new tile floors, new furniture and new TVs, this three bedroom third floor ocean view condo is a perfect vacation spot for you and your family. Golf packages are available for the golfers who still want to see the beach when they are not on the golf course. Call today for package rates, starting as low as $149 per golfer per day, based upon 4 golfers with three night minimum, plus tax and fees. The kitchen has perfect views overlooking the family room and out to the Atlantic Ocean. Enjoy the ocean views from the dining area or breakfast area. Walk out to the covered veranda from the living room or guest room and enjoy the views. The master suite is to the left of the living room has views of the Atlantic Ocean for you to enjoy every morning when you wake up or when you go to bed at night. The master suite has king size bed, large en suite master bath and LCD TV. The guest room overlooking the ocean has king bed with en suite guest bath. The third bedroom shares the bath in the hall way and has two twin beds. New living room furniture, all new tile floors and new paint make the condo feel brand new. Palmetto Dunes is ranked as one of the top family resorts in the United States with three championship golf courses, numerous tennis courts, several restaurants and bars with miles of bike paths to enjoy. Hilton Head Island has over 30 golf courses, 117 miles of bike paths, hundreds of tennis courts, over 250 shops and over 200 restaurants all within miles of Palmetto Dunes. Call today to book your dream vacation in Hilton Head Island. This entry was posted on 06/10/2016 by Emmett Hawkins.